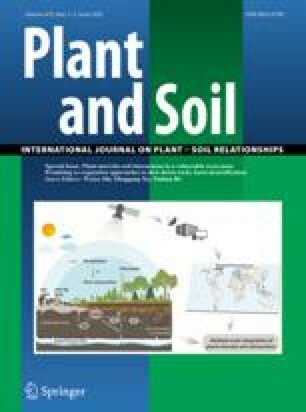 Roots of annual crop plants are a major sink for carbon particularly during early, vegetative growth when up to one-half of all assimilated carbon may be translocated belowground. Flowering marks a particularly important change in resource allocation, especially in determinate species, with considerably less allocation to roots and, depending on environmental conditions, there may be insufficient for maintenance. Studies with 14C indicate the rapid transfer belowground of assimilates with typically 50% translocated in young cereal plants of which 50% is respired; exudation/rhizodeposition is generally <5% of the fixed carbon. Root: total plant mass decreases through the season and is affected by soil and atmospheric conditions. Limited water availability increased the allocation of 13C to roots of wheat grown in columns so that at booting 0.38 of shoot C (ignoring shoot respiration) was belowground compared to 0.31 in well-watered plants. Elevated CO2 (700 μmol CO2 mol−1 air) increased the proportion of root:total mass by 55% compared with normal concentration, while increasing the air temperature by a mean of 3 °C decreased the proportion from 0.093 in the cool treatment to 0.055 in the warm treatment.